The Body Shop 50% Off PLUS FREE Shipping! You are here: Home / Great Deals / The Body Shop 50% Off PLUS FREE Shipping! Right now you can get 50% off at The Body Shop PLUS FREE shipping with any purchase! Plus you get a FREE gift with any order over $50! Just use code: SAVE50 at checkout to get yours! Offer expires 12/8/14 – TODAY SO HURRY! The “50% Off Your Purchase” Offer (the “Offer”) entitles customers to receive 50% off all regular-priced products, excluding applicable taxes. 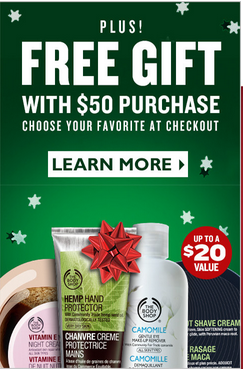 Offer valid December 8–10, 2014 online only at www.thebodyshop-usa.com. The Offer cannot be combined with any other offers, discounts or coupons, with the exception of the LOVE YOUR BODY™ membership discounts. Offer excludes Vitamin E Aqua Boost, Red Musk Perfume Oil 30ml, Red Musk Eau de Parfum 60ml and 100ml, Nutriganics Drops of Youth 30ml and 50ml, Drops of Youth Eye Concentrate 15ml, accessories $6 and under, pre-packaged gift sets, kits, sale items, Online Outlet items, charitable items, and purchases of LOVE YOUR BODY™ membership cards and gift cards. Returned items will be refunded at the discounted price. Offer is not applicable to prior purchases. Offer subject to change without notice. The Body Shop reserves the right to cancel any order due to unauthorized, altered, or ineligible use of discount and to modify or cancel these promotions due to system error or unforeseen problems.